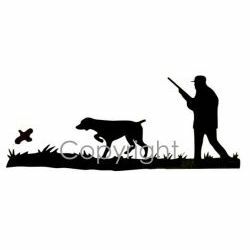 This a bird hunter's decal depicting a bird hunter following his trusty pointer. Available in large or small sizes. These Hunting Dogs Hunting vinyl decals and stickers are for display on trucks, cars, trailers, boats, gun cases & other smooth surfaces.